Beauty from the Earth Cosmetics is another indie company with a great reputation. They have a large range of eyeshadows and other powder cosmetics and have a professional looking and easy to navigate website - always helpful! Every week BFTE offers a deal for a full size eyeshadow (the Color of the Week) and 3 samples of your choice for $6 (plus shipping). I've ordered the COTW deal 3 times now and its always shipped out within a couple of days. Last week they had a new shade 'Drama Queen' as the color of the week, so I picked another 3 colors and placed my order. I received the package about a week and a half later (to New Zealand) - pretty quick! 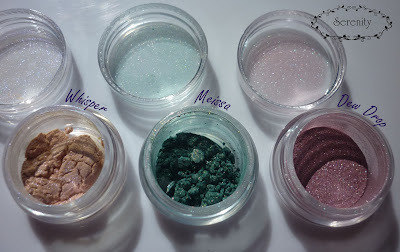 This is the full size I received - I'm pretty sure these are the same jars Fyrinnae uses for their full sizes, but they contain less product due to the sifter. 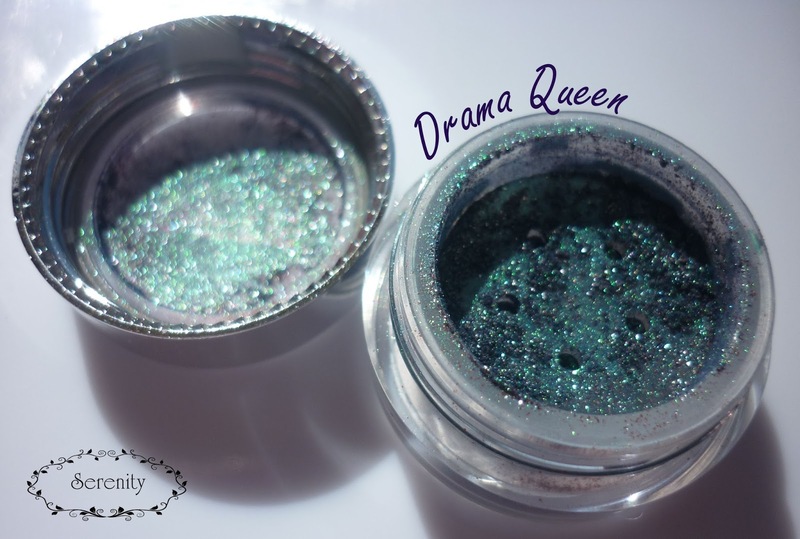 (Fyrinnae jars are absolutely PACKED). I have to admit, I don't like this color as much as I thought I would - it has a bit too much sparkle and not enough base for my taste. The base seems to be a brownish color packed with green shimmers and sparkle. 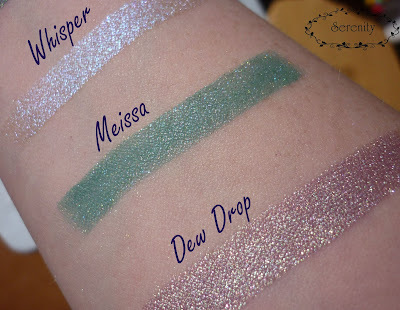 These are the samples I picked - Whisper, Meissa and Dew Drop. Whisper and Dew Drop are from the Duotone category since I'm such a huge sucker for the duochromes :P Meissa is from the Pro Colors range. These samples are a pretty good size (about 1/4 teaspoon), and I do love that they come in jars. I adore Whisper, it has a sheer pale base with an intense blue-violet sheen. I'm pretty sure I'll end up grabbing a full size of this one! 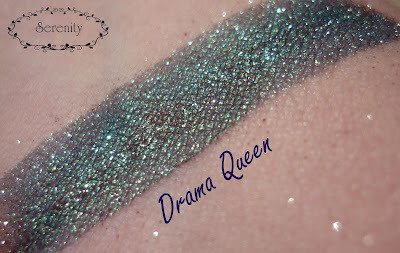 Meissa is a great shade, and I found it smooth and easy to apply. Dew Drop is a 'pinkish purple with a greenish gold duochrome' - I generally love anything with a green duochrome, this one has a great base color too. BFTE cosmetics are available from their website and you can follow on Facebook for updates, COTW announcements etc.